Science, it is sometimes claimed, is neutral: it is up to society to decide how to employ research findings. Yet society often struggles with its end of the deal. That is because science can also hold up a mirror to the results of our culture’s choices—and we may not like what we see. Consider antibiotics. Since their discovery decades ago, these “wonder drugs” have been used far more widely than for the treatment of sick patients. Tourists take them when they go on vacation to prevent traveler’s diarrhea. We give them to livestock, helping to keep our meats cheap. In Science Agenda, the board of editors suggests a way to reduce the development of further resistance: stop dosing pigs, chickens and other farm animals with subtherapeutic amounts of antibiotics. The U.S. can take a lesson from Denmark, which has efficiently raised livestock without hurting farmers, by using better animal husbandry practices. Last, brain scans have transformed our understanding of cognitive processes. Could they factor into trials, by providing insights into an accused’s mental state? Michael S. Gazzaniga considers the challenges involved in “Neuroscience in the Courtroom". As it turns out, neuroscience’s greatest influence may be in identifying root causes of illegal behaviors. But the choice of how to use the science is, ultimately, also society’s to make. A few months ago I wrote about Scientific Americans participation, as a part of Nature Publishing Group, in Change the Equation. This CEO-led initiative, part of the White Houses Educate to Innovate program, seeks to boost learning in science, technology, engineering and mathematics (STEM). Soon we will be launching our first related project, called Bring Science Home. A challenge of improving our nations performance in science education is that children who get turned off at a young age may never come back. 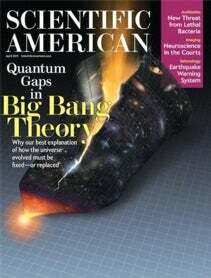 And studies have found that even in kindergarten, students are forming negative views about science see “Start Science Sooner,” SA Perspectives; [Scientific American, March 2010]. I thought: How can non-STEM parents help foster STEM-loving kids? That was the inspiration behind Bring Science Home, led by Katherine Harmon of our online team. For the month of May, www.ScientificAmerican.com will feature one science- related activity each weekday, which parents and their six- to 12-year-olds can do together. We consulted with members of the National Science Teachers Association so that the activities would echo themes taught in early grades. Parents will also find additional background to help them explain the concepts. But the overarching goal was simple: each activity had to be easy and fun, done with household ingredients and completed in less than an hour. In the next issue, I will update you on other STEM efforts.